Commander of the Islamic Revolution Guards Corps (IRGC سپاه پاسداران انقلاب اسلامي ايران) Major General Mohammad Ali Jafari سرلشگر محمد علي جعفري on Saturday traveled to flood-hit zones in Iran’s northern province of Golestan for the second time in a week. His second visit is aimed at inspecting relief operations there and speeding up handling and support for the rescue efforts, particularly in the city of Gomishan گميشان. 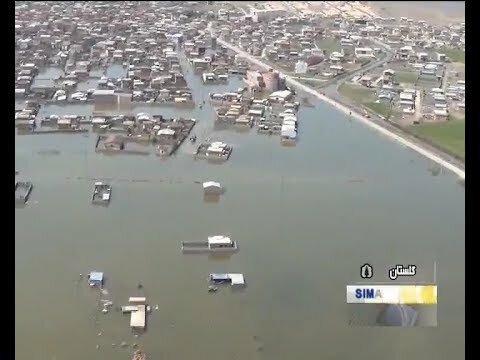 The IRGC Navy force has also set up a large field hospital in Siminshahr سيمين شهر, Gomishan District بخش گميشان, to treat those injured in the floods and help those in desperate need. More than two dozen people have been killed as a result of the flooding countrywide. The southern city of Shiraz, the capital of Fars province, with 19 deaths that occurred during Monday's floods accounts for the highest number of casualties.